Access our physical collections by visiting our Finding Aids page. Finding aids are research guides or inventories that describe contents of collections. Explore our Digital Collections for Northeastern University images, histories, course catalogs, and yearbooks, as well as digitized contents of collections. 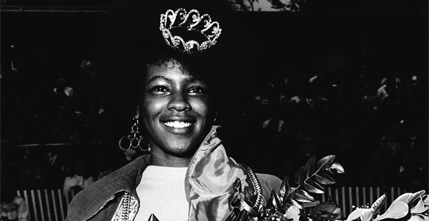 Homecoming Queen Linda Brown holding a bouquet of flowers, 1972. 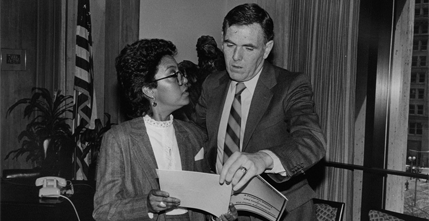 Carmen Pola, director of Boston's Department of Constituency Services, and Mayor Raymond Flynn, right, reviewing a progress report, ca. 1986. 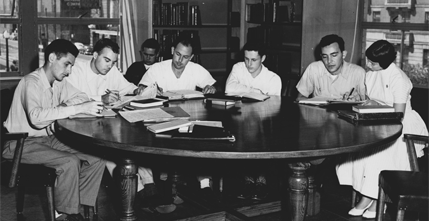 Students studying in Dodge Library, 1952. 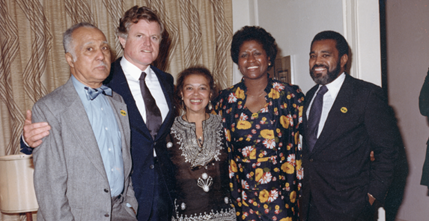 Senator Edward Kennedy with the Snowdens, Ellen Jackson, and Bertram Lee at the Snowdens' home, ca. 1980.